On Nov. 7, a container ship struck the Bay Bridge and spilled 58,000 gallons of oil into San Francisco Bay, which has spread for miles along the coastline. In the Black Sea and San Francisco Bay, tens of thousands of birds, countless marine creatures and a half-dozen people died following oil spills. The spills in the Black Sea were caused by ships running aground and sinking during the worst storm the region has seen in decades, while the spill in the Bay Area was caused by a lone container ship hitting a bridge in fog. Environmental groups working in both regions call the spills ecological catastrophes. In Russia, a severe storm struck the Black Sea on Nov. 11. Nearly a dozen ships and tankers were damaged or sunk, causing 979,000 gallons of oil to be released into the Kerch Strait, which leads into the Black Sea, The Associated Press (AP) reported Nov. 21. The World Wildlife Fund, which has been working to clean up the region, says that 11 endangered species of birds inhabit the region, and many more migrate through the area; some 15,000 birds have been killed. Russian officials estimate the damage from the spill could reach up to $251 million, AP reported. In California, a container ship navigating San Francisco Bay struck the Bay Bridge on Nov. 7, ripping a 27-meter-long gash down the side of the ship and spilling 58,000 gallons of thick fuel oil into the bay. About 2,150 oiled birds have been found dead so far, but workers estimate as many as 20,000 may have died from the spill, the San Francisco Chronicle reported Nov. 27. Several beaches and piers have been closed, and the spill is impacting local fishing and crabbing. 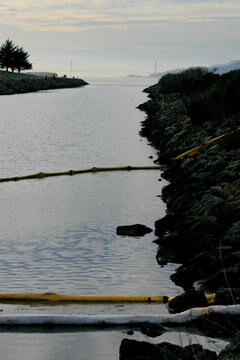 Some experts suggest the region may be affected by the spill for the next 10 to 20 years, the Chronicle reported. The captain and crew of the ship were held as an investigation continued.